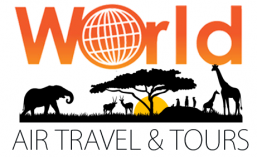 World Air Travel & Tours LTD specialize in Wildlife Safaris, Mountain Trekking (eg. Mt Kilimanjaro), Air Ticketing (local and international IATA and non-IATA accredited), Beach Holidays, Specials like Balloon Safaris, Bird-Watching Safaris, Hotel and Lodges Reservation, Honeymoon Packages, Cultural Packages, Car hire and Rentals and Tailor-made Packages. We are located in Arusha (Tanzania) and have also branches in Dar es Salaam and Morogoro. The company’s mission is to exceed its clients’ dreams and expectations through timely delivery and appropriate provision of quality service while effectively using the local people and their environment and knowledge to enhance the experience. Provide our clients with the opportunity to learn, have fun and experience Africa from a new perspective through travel. It is our goal to treat every client in an honest and personalized manner as they embark on an adventure filled with value, education and priceless memories. All the professionals at World Air Travel & Tours Limited are masters of their trade and each brings with him/her a unique set of experience adding value to the traveler’s overall experience of the country. The company’s vision is to maintain a consistent, ethical and sustainable internationally accepted standard services, that will contribute greatly to the country’s economic as well as social growth. There you can get more information about the company, our itineraries and our contacts. Good stuff. Aged 66, I am unlikely t make it to Tanzania, but I do have an invite to go to Senegal to teach a bit in a new school. I spent 6 months in Gabon. I love Africa …. One is never too old for Tanzania – there are tours and accommodations for every age. And I am sure if you are fit enough for Gabon and Senegal, then Tanzania will be easy 🙂 Invitation for teaching sounds great, are you going? I was just in Tanzania last year! I did Kiliminjaro, went on a safari and got engaged in Zanzibar. Hope to come back someday – such a beautiful country! I’m so grateful for my time there! Oh wow, the whole program 🙂 I am sure it was an unbelievable experience, especially with the engagement in Zanzibar at the end. Welcome back to Tanzania! There is still so much more to explore. Thanks for visiting and liking my blog. I’d never been to Africa before this time–I see why you’re passionate about it! Well done! How I would love to go on a Safari! I have been to Africa about 40 times, but have never had the opportunity. Maybe the next time I pass through Arusha, you can take me out. Thanks for liking my photo post. Your tours look really interesting, Tanzania looks amazing. Yes it is such a beautiful country. Thank you for the support much appreciated. and sign up for my newsletter 🙂 (www.theliving360.com). Just was in Arusha two weeks ago, Really miss the weather and beauty! The world is completely breath taking. If you guys have specials, please do let me know:) I live in Chicago, IL! Will share pictures from my trip. Great, will let you know! Am looking forward to your photos! (Karibu) swahili word for ‘welcome’. Your blog is very interesting as well. We look forward to expanding our Incl. market to Italy hopefully one day we will connect.